Meetings are held on the 2nd Wednesday of the month. 6206 Route 21, Williamson. Located between Ridge Rd and Route 104. Meeting starts at 7pm. Due to technical difficulties, the two presentations that were to be given last month will be presented at this April meeting. We will be viewing the two presentations: "Due Process Denial" and "Gun Owners Need to Educate Themselves". We will also review the handout: "SAFE Act Impact On Citizen's-Premeditated Confiscation." We will also elect a Vice-Chairman and Secretary. A 2nd Amendment Defense Organization, defending the rights of New York State gun owners to keep and bear arms! 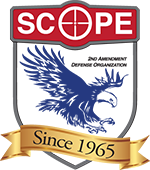 SCOPE is a 501(c)4 non-profit organization.